Aside from a prologue where the spread of a humanity-eradicating virus plays out in mock news footage projected on a map of the globe, Dawn of the Planet of the Apes begins and ends with the same pair of enraged eyes. Those eyes will be familiar to anyone who saw the spectacular first installment of this rebooted series, 2011’s Rise of the Planet of the Apes. 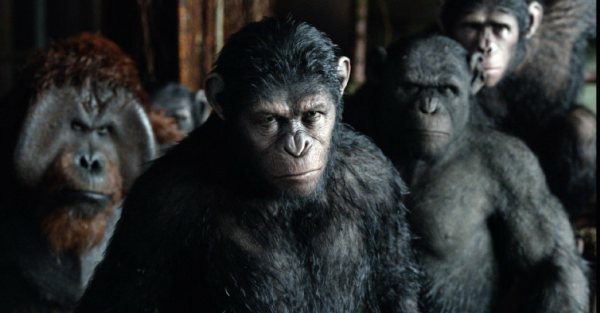 They are Caesar’s, the ape brought to inquisitive, now-domineering life in yet another astonishing motion capture performance by Andy Serkis. Part of what made Rise such a thrill was they way it surrounded its outbursts of action-movie violence with an emotionally resonant, elegiac beauty. CGI apes were utilized not just as disposable bodies for battle scenes, but as characters even more important than the humans. Images of young Caesar sitting at a piano with an old man with Alzheimer’s, or a horde of freed apes swinging through rustling trees as pedestrians stop on the street to look up are just as memorable as the incredible action set piece on The Golden Gate Bridge. It was a summer blockbuster that insisted on taking its time, making its big finale (and the shouting of the word “No!”) all the more rousing. 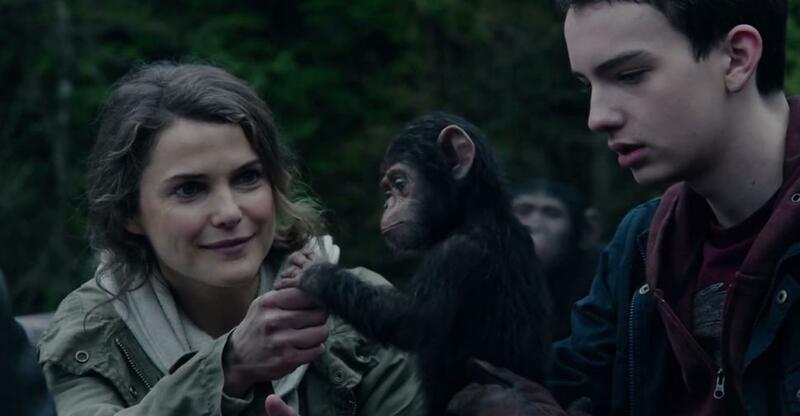 Matt Reeves’ Dawn of the Planet of the Apes isn’t quite as successful as Rupert Wyatt’s first installment. There are intense, well-constructed sequences of ape-on-human warfare as well as glimpses into the society that Caesar and his following built after escaping San Franciso, but I didn’t have the contact high I left with after Rise. Their war was a foregone conclusion here, and while the constant narrative conflict isn’t boring, it doesn’t give the same sense of self-discovery and surprise that Caesar’s budding consciousness offered in the first one. Dawn attempts to draw (some would say force) connections between the human characters and the ape ones. Peacemaking leaders like Caesar and Malcolm (Jason Clarke) are followed by violent, gun-loving comrades and nurturing mother figures. As Dana Stevens noted in her review on Slate, females (human and ape) don’t really exist in any other capacity as characters here. Malcolm and his companions leave a human colony in San Francisco to try and re-power a dam to restore lasting electricity, inadvertently stumbling on the apes’ land. Many of the movie’s most poignant inter-species interactions happen in this segment, with a shaky truce formed between the two groups. The script, by Rick Jaffa, Amanda Silver and Mark Bomback, under-develops almost all of the characters but Caesar. This is especially clear after an assassination attempt on him puts the war-mongering Koba (Toby Kebbell) in charge. Koba was experimented on and tortured for years in human laboratories, but there’s no attempt to garner sympathy for him like there is Caesar. He mounts a full-on offensive on the San Francisco colony to kill all humans, and although the sequence is harrowing and wonderfully edited, at this point both the apes and the humans often become disposable, empty masses. Koba’s relationship to Caesar doesn’t live up to its Shakespearean aspirations, and their final feud on top of a skyscraper doesn’t hold a candle to the simpler sequences from Rise I mentioned earlier. There are many opportunities to develop other characters that the movie doesn’t take, from Caesar’s disgruntled son to a grieving father played by Gary Oldman. Serkis again gives a fine motion capture performance as Caaesar, but putting the entire movie on his character’s shoulders is a risk that doesn’t fully pay off. This entry was posted in Reviews and tagged Andy Serkis, Dawn of the Planet of the Apes, Dawn of the Planet of the Apes review, Gary Oldman, Matt Reeves, Summer 2014 movies by matterspamer. Bookmark the permalink.